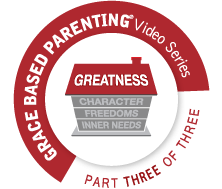 Introduction to the grace-based parenting model and the four parts or dimensions that make up this grace-based plan for parenting. 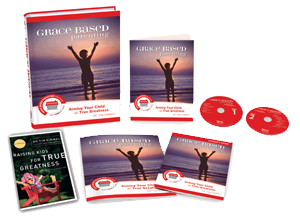 Enjoy learning about raising your kids the way God raises His – with grace! It is easy to focus on the wrong priorities when we are raising our kids. Aiming our kids at a future of success has some major drawbacks. Truly great people are the ones we turn to in our time of need. The Four Superficial Measurements that our culture has for success. God’s math is different from the world’s math when it comes to how He adds up the things that truly matter. The Sermon on the Mount gives us many paradoxes that illustrate the heart of true greatness. Those who pursue God’s heart for true greatness gain a reward that lasts forever. Grace is the phenomenal power behind true greatness. There are four qualities of a truly great heart. Parents who live a life of true greatness themselves have the greatest opportunity to build these four qualities into their children’s’ hearts. Our power to raise truly great kids comes from God. Comparing scarcity thinkers with abundant thinkers. Abundant thinking prepares a heart for true greatness. The impact of answering these questions well; both here on earth and for eternity. How true greatness prepares our children to thrive in life. You can do it parents.